"There's no way Independents did this," Christian said. "It looks like a whole battalion landed here." Frantic, Sigrid scanned the area again, searching desperately for signs of the girls, but nothing turned up in her sensory modes. She tried calling out with her comlink. If they were in range, they'd pick up the signal. But there was still nothing. Not even the orbital satellites showed any sign of the girls, or survivors for that matter. Whoever had done this had been brutal and thorough. Known only to Kimura, the two girls share startling secret - a rare genetic structure not found in tens of millions of other girls. Seriously this was the most "me" a book has ever been. From the lesbian lead to the super space mercenaries, Alcyone is practically tailored to geeky gay girls, which is in my estimation a horribly underserved demographic. 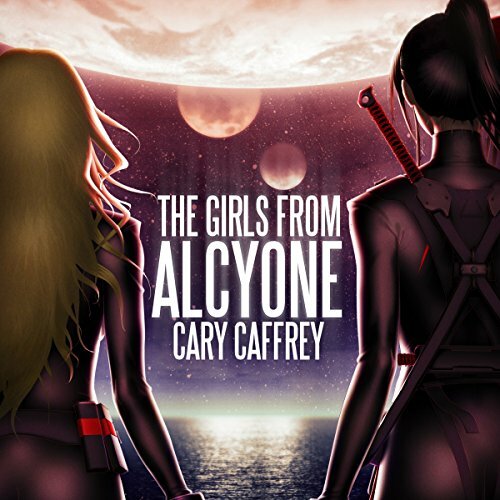 The Girls from Alcyone by Cary Caffrey is the first novel in the series by the same name. In the 24th century on Earth, the world is controlled by corporations. Trying to escape financial ruin, many sell their children to mercenary companies, such as the Kimura Corporation. Sigrid is one such child. Her parents sold Sigrid to the Kimura Corporation for the money, but little do they know that Kimura sought Sigrid out because of her genetic make-up. This genetic make-up will allow them to alter her into an enhanced killing machine. Sigrid comes to Kimura scared and the runt of the group, leading to a lot of bullying. But as the girls at Alcyone develop and grow, they begin to realize that they are pawns in a greater war amongst the corporations. Sigrid and her friends must figure out a way to live as free women untethered to and unsought by any corporations. This was an action filled story that followed the girls at Alcyone, the Kimura research facility, from the time they are girls to adulthood. Caffrey does a good job adding in parts throughout to highlight the relationships between the girls as they grow older. I especially liked the later parts of the story when Sigrid is on her own acting as a mercenary. That is the time that she is the most strong and smart and becomes her own self and a leader. There is a nice mix of getting to know more about the characters and action. However, even though the story had all the elements that I love in a story, somehow I didn’t love the character of Sigrid, I felt like there was still distance between the characters and the reader, and that I wasn’t completely engrossed in their lives. This might be because of how much time the novel covers. Additionally, the science aspect was glossed over considerably. Overall, there were a lot of twists and turns to the story and filled with adventure. The narration by Kristin James was good. She was able to consistently capture the voices of the characters. There were some accents that I didn’t like, in that they felt a little off, but overall the characters were distinguishable and consistent. The production quality was good as well. I would recommend this novel to anyone who likes stories about rebelling against the controlling population and a story full of powerful women. I enjoyed the characters and plot of the story. The interesting use of genetics to develop enhanced soldiers. Choosing young girls and the smallest girl to exhibit the best results, loved it-- great characters and an excellent choice for the narrator. I enjoyed her choice of voices to relay each character and several sounded the same way I thought they would when I read it the numerous times before purchasing the audios for all three books. I'm ready for another, or at least a novella to see what adventures the two have after book three. Read previously, now is listening to.High frequency pitch background is so uncomfortable. Just want to let everyone know.Will listen to all of this series definitely. I was pleasantly surprised by this story. The narration was very well done and I could not stop listening till the book was finished. If you like science fiction you have like this. I listened to all three books back to back and loved them. book 1 was an interesting book. the storyline was good and the girls where amazing. THE GIRLS FROM ALCYONE has wonderful elements of both cyberpunk and space opera all wrapped up in a sweet little package named Sigrid Novak. On Sigrid's journey from the little girl who was sold by her parents to a genetically enhanced woman who is as much cybernetic weapon as human, I was right there with her. As she faced hazing and bullying, as she found her strength and confidence, as she fell in love, as she became the most skilled mercenary the universe has ever seen. Author Cary Caffrey was careful with the feminist overtones, keeping them delicate and natural to the story. Caffrey's penchant for action scenes is matched only by his world-building, which includes vivid fashion and incredible settings. As entertaining and engaging as an audiobook as it was in print--highly recommended! What made the experience of listening to The Girls from Alcyone the most enjoyable? A fairly standard story of kids being trained for military service. There are some interesting ideas about interstellar government. Good enough to keep going through the series, though the villains are distinctly underdeveloped and two dimensional. Would you listen to The Girls from Alcyone again? Why? No, not that I hated the book or anything like that. Would you be willing to try another book from Cary Caffrey? Why or why not? Yes differently. At some point I will listen to book 2. What does Kristin James bring to the story that you wouldn’t experience if you had only read the book? Kristin uses a good variety of different voices and it makes the book more enjoyable. This little girl is all grown up now. After all her training, I would have liked Sigrid to have gone back to earth and maybe visited her family.